Architect Clough Williams-Ellis (born May 28, 1883 in Gayton, Northamptonshire, England) is best-known as the creator of Portmeirion, a village in Wales, yet as an environmentalist he also helped establish the British National Parks system and became knighted for his "services to architecture and the environment." Son of the Reverand John Clough Williams-Ellis, young Bertram Clough first moved to Wales with his family when he was only four. He went back to England to study mathematics at Trinity College in Cambridge, but he never graduated. From 1902 to 1903 he trained at the Architectural Association in London. The budding designer had deep Welsh and English connections, being related to the medieval entrepreneur Sir Richard Clough (1530–1570) and the Victorian poet Arthur Hugh Clough (1819-1861). His first designs were numerous parsonages and regional cottages in England and Northern Ireland. He inherited some property in Wales in 1908, married in 1915, and raised a family there. After serving in World War I, he designed a number of war memorials and travelled to architecturally rich countries like Italy, an experience that informed his sense of what he wanted to build in his homeland. In 1925 Clough Williams-Ellis began building in Portmeirion in northern Wales, and he didn't finish until 1976. Located on Sir Clough's private peninsula on the coast of Snowdonia, Portmeirion first opened in 1926. That year, Sir Clough also founded the CPRE (Council for the Protection of Rural England). He established the CPRW (now Campaign for the Protection of Rural Wales) in 1928. Portmeirion was not a continuous project, however. He continued to design residences and in 1935 he designed the original summit building on Snowdon, which became the highest building in Wales. Forever the conservationist and environmentalist, Sir Clough helped establish the British National Parks in 1945, and in 1947 he penned On Trust for the Nation for the National Trust. He was knighted in 1972 for "services to architecture and the environment." He died at his home in Plas Brondanw on April 8, 1978. The flamboyant and largely self-taught Bertram Clough Williams-Ellis devoted his life to the cause of environmental preservation. His work on the resort village of Portmeirion, Wales represented his efforts to prove that it was possible to build beautiful — and colorful — housing without defiling the natural landscape. Sir Clough was 90 years old when Portmeirion was completed. Portmeirion is riddled with anachronisms. Greek gods mingle with gilded figures of Burmese dancers. Modest stucco bungalows are decked with arcaded porches, balustraded balconies, and Corinthian columns. It's as though the designer tossed 5,000 years of architectural history along the shore, without a care for symmetry, accuracy, or continuity. Even American architect Frank Lloyd Wright paid a visit in 1956, just to see what Clough was up to. Wright, who also boasted a Welsh heritage and a concern for conservation, praised the innovative combinations of architectural styles. Portmeirion became an exercise in historic restoration. Many of the structures were pieced together from buildings destined for demolition. The village became known as a repository for fallen architecture. Portmeirion designer Sir Clough Williams-Ellis didn't mind when visitors called his quirky village Home for Fallen Buildings. Architect Clough Williams-Ellis moved amongst artists and artisans. 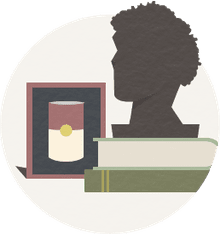 He married the writer Amabel Strachey and fathered the artist/potter Susan Williams-Ellis, originator of Portmeirion Botanic Garden dinnerware. Viewers of the 1960s television series The Prisoner will find some of the landscapes eerily familiar. The bizarre prison kingdom where actor Patrick McGoohan encountered surreal adventures was, in fact, Portmeirion. The vacation village of Portmeirion nestles on the northern coast of Wales, but there's nothing Welsh in the flavor of its architecture. No stone cottages here. Instead, the hillside overlooking the bay is dotted with candy-colored houses which suggest sunny Mediterranean landscapes. There are even swaying palm trees around the tinkling fountains. Portmeirion village in Minffordd has become a destination vacation and event venue in northern Wales. It has accommodations, cafes, and weddings all within a Disneyesque community. Vacationing within a fanciful, planned community was big business in the 1960s, after the success of California's Disneyland in 1955 and before the 1971 opening of Florida's Walt Disney World Resort. Sir Clough's idea of fantasy, however, took on more Italianate tone than Disney's mousechitecture. The Unicorn Cottage, for example, was a British-Italian experience in the Welsh countryside. Since 2012, Portmeierion has been the site of an arts and music festival called Festival No6 — named after the main character in The Prisoner. For one long, exhausting weekend in early September, Sir Clough's village is home to the quirky fringe who seek poetry, harmony, and a Mediterranean refuge in northern Wales. Festival No6 is billed as a "festival unlike any other" — no doubt because the fanciful Welsh village is itself a fantasy. In the TV show, the sense of geographical and temporal displacement suggests that this village was created by a madman. But there was nothing crazy about Portmeirion's designer, Sir Clough Williams-Ellis. His lifelong concern was with environmental preservation. By building Portmeirion on his private peninsula in Snowdonia, Wales, Sir Clough hoped to show that architecture can be beautiful and fun...without defacing the landscape. Despite these high-minded intentions, however, Portmeirion is, most of all, entertaining. Clough Williams-Ellis was a master of illusion, and his designs confuse, delight, and deceive. Originally the Piazza was a tennis court, but since 1966 the area has been a quiet paved area with a blue tiled pond, a fountain, and lavish flower beds. Along the southern edge of the Piazza, two columns support gilded figures of Burmese dancers. A low stone stairway climbs to the Gloriette — a playful structure named after the grand monument at the Schönbrunn Palace near Vienna. Built in the mid-1960s, Portmeirion's garden room or gloriette is not a building, but a decorative facade. Five trompe l'oeil windows surround the open doorway. The four columns are the work of 18th century architect Samuael Wyatt, salvaged from the colonnade of Hooton Hall, Cheshire. Built between 1958 and 1959, Bridge House seems larger than it really is because of its tapering walls. When visitors pass through the archway from the parking area, they encounter their first breathtaking view of the village. Built in about 1760, the Colonnade stood in front of a Bristol bathhouse in England. It was falling into decay when Portmeirion's creator moved the structure to Portmeirion — piece by piece.in 1959. Several hundred tons of delicate masonry were disassembled and transported to the Welsh village. Every stone was numbered, and replaced according to precise measurements. 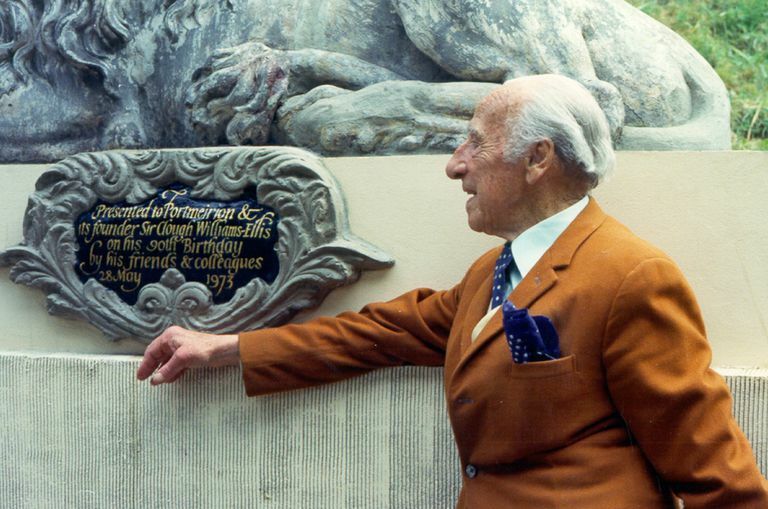 Sir Clough Williams-Ellis, today recognized as one of the United Kingdom's first conservationists, wanted to show that "the development of a naturally beautiful site need not lead to its defilement." An assortment of urns and columns line the flower strewn Promenade atop the Bristol Colonnade — rebuilt in the Welsh hillside, overlooking The Piazza and the village. The integration of walkways atop, over, through, and into Sir Clough's designed village ties together the themes of community and harmony within an Italian Renaissance architecture. The dome at the Promenade's end replicates the famous Brunelleschi dome in Florence, Italy. In this miniature of a stately Chatsworth home, architect and Portmeirion master planner Sir Clough Williams-Ellis creates the illusion of a classic Georgian estate. Elongated windows, long pillars, and an undersized gate make the Unicorn seem tall, but in fact it is a dressed-up bungalow built in the mid-1960s...and only one story high. Several cast iron mermaid panels, salvaged from the Old Seaman's Home in Liverpool, form the sides of the Hercules Gazebo, built in 1961-1962. For many years, the Hercules Gazebo was painted shocking pink. The structure is now a more subtle terra-cotta shade. But this playful facade is yet another example of architectural illusion — as a space to house mechanical equipment, the Gazebo disguises a generator. Hotels and cottages dot the planned landscape of Portmeirion, just as they would in any village. Chantry Cottage, with its red-clay tile Italiante roof, sits high atop the hill, above the Bristol Colonnade and Promenade below. Built in 1937 for the Welsh painter Augustus John, Chantry Cottage is one of the earliest structures built by Sir Clough Williams-Ellis and today is a "self-catering cottage sleeping nine." But it all began with legendary mermaids, real or not. Dating from the 1850s, the Mermaid house was present on the peninsula when building began at Portmeirion. For many years it was used to house village staff. Sir Clough dressed up the cottage with an imposing metal canopy and the welcoming palm trees sprinkled throughout the village. Landscape design and Italianate architecture is how Sir Clough created the illusion that we are in sunny Italy...not in wet and windy North Wales. And it works.